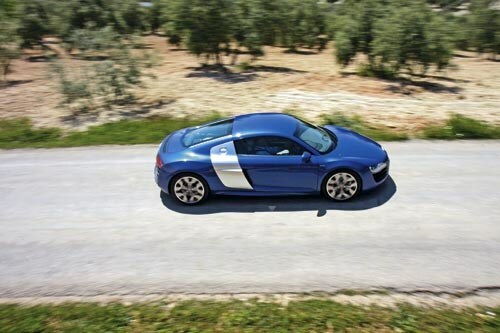 It’s almost two years ago to the day that I first drove the V8-engined Audi R8 and whilst admiring its build quality and the depth of engineering that had gone into it, given the choice between that, a 911 or the latest Aston Martin Vantage I would have opted for either of those and not Audi’s first crack at a supercar. I know fellow contributor, Howard Walker rated the Audi high enough to make it his car of the year, but it didn’t quite deliver that tingle down the spine I feel a car of this nature should. It left me slightly cold. Would the second model in the range, now powered by an Audi version of Lamborghini’s V10 hit the Adcock hot-spot? Although the bigger engine adds 31kg to the car’s weight, the 386kW, 530Nm engine more than makes up for that with gains of 77kW and 100Nm over the V8. Subtle styling changes wrought to the car include chromed grille and front air intakes, more pronounced side sills, wider side vents, chromed rear air outlets, twin oval exhausts and a new rear diffuser. 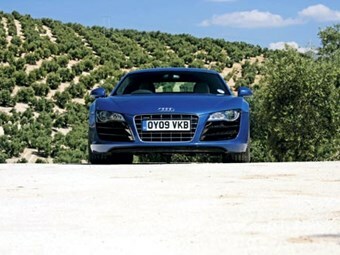 Combined, they give the R8 a more determined and aggressive road presence. If springing to life a 5.2-litre V10 that’s red-lined at 8700rpm doesn’t make the hairs on the back of your neck stand up then you’re either stone deaf or dead. With a typical piece of street theatre that, for one, Aston also uses the engine waps round to 2000rpm before settling to a steady idle. A firm hand is needed to slide the gear knob through the retro style gate to engage first and the clutch itself is quite heavy as you release it whilst letting off the handbrake, but as soon as you start to accelerate and the V10 engine note increases in pitch you sense you’re in for something special. As indeed you should in a car capable of despatching zero to a 100 clicks in 3.9, doubling that speed takes only a further 8.4 seconds on the way to a nerve rattling 315km/h. Sensibly Audi’s driving route didn’t feature roads free of traffic or straight enough to allow any of us to approach its maximum velocity, although my best of around 200km/h-plus was achieved with contemptuous ease. 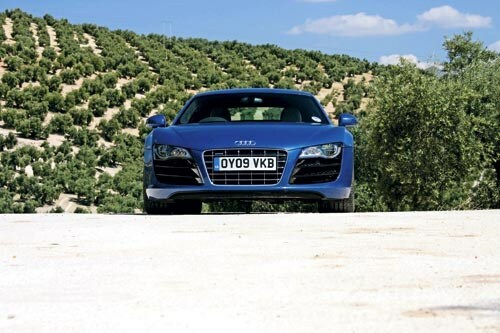 The engine screaming round to its heady red-line encourages hard acceleration, but what is really impressive is the manner in which the car slingshots out of corners, the quattro system shuffling 10 to 35 percent of the power to the front wheels depending on available grip. It remains wonderfully balanced, even when the ESP lights start to flicker – in the dry I might add – you don’t feel as though there’s some dead-handed electronic algorithm lurking in the software to spoil your fun. The steering is beautifully weighted, communicating perfectly just what those front 19-inch rims with 235/35 tyres are doing whilst the ride from the magneto-rheological dampers is a splendid combination of comfort without harshness, even with 295x30 tyres on 11j rims at the back, and firm body control. 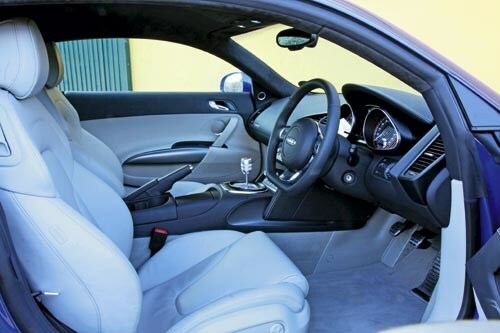 If there’s one surprise it is in the engine’s flexibility – it will pull from about 50km/h in sixth gear with barely a murmur. I am not sure why anyone would want to do that, but it demonstrates what a fine job the Audi engineers have done in creating an easy to drive, flexible sports car that’s knocking on the door of the supercar club. So, did the latest R8 win me over? What do you think?